Something special happens when you roast cauliflower – it almost tastes like popcorn! This is my absolute favorite way to prepare cauliflower, and one of my favorite veggie recipes of all time! Cauliflower was actually the first veggie I ever attempted to roast after spotting a recipe for it on a website called Summer Tomato. The author of Summer Tomato, Darya, said it still freaks her out how good the recipe is, so I knew I had to try it! Try I did, and I fell in love. Something happens to the cauliflower while it’s roasting that turns it from a bland, somewhat boring veggie, into a super flavorful one. I use this description loosely, but roasted cauliflower almost tastes like popcorn, no joke! PS: Can you tell I’m on a cauliflower kick lately? If you haven’t checked out my recipe for using cauliflower in place of dough for bread sticks, check it out …. Cheesy Caulifower Breadsticks – it’s amazing! 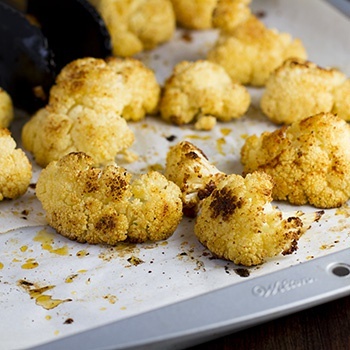 Place the cauliflower on the baking sheet and toss it with olive oil, salt, chili powder, garlic powder, or any seasonings of your choice. Cover tightly with foil and bake for 15 minutes. This will prevent the cauliflower from burning during the roasting process. Remove the cauliflower from the oven and remove the foil. Place the cauliflower back in the oven, this time uncovered and continue roasting for 35-40 minutes, or until the cauliflower starts to turn brown. Remove from the oven, and adjust seasonings according to taste- you may need a little more salt. Enjoy!